Today brings us Mr. Kitty’s third and final chapter, and we only have three more chapters left in the entire novel after this one. I hope you’re enjoying the story so far. If so, you can pick up a full copy of the novel on Amazon right here. Now have at it. Tillie was all packed up. She peeked her head out of the bedroom door and sighed. Mr. Kitty could tell she was upset when she opened the front door and called back, “I’m leaving, dad!” There was no answer, so she added, “Don’t even try to stop me!” and slammed the door. Mr. Kitty had to react fast to prevent his tail from being crushed. “Hey,” he hissed. “Sorry, Kitty. I—I didn’t see you,” Tillie said through her sobbing. Mr. Kitty tried to rub up against her leg as she tried to walk, but he ended up tripping her. She landed with a thud in the grass, her backpack narrowly missing him. “I do,” Mr. Kitty meowed. “Oh, I bet you’d believe me if you understood what was going on,” Tillie said. “I do,” Mr. Kitty repeated. “I do!” Mr. Kitty said one more time. Mr. Kitty didn’t answer. He thought it sounded like an okay plan, if that was what she wanted to do. She could get more evidence from her dad’s computer before she left, that way people would be more easily convinced, but even if she could understand his advice, she probably wouldn’t break her dad’s trust like that, so there was no point in suggesting the idea. Instead, he ran ahead through the yard toward the public elevator. “I’m a ninja,” Mr. Kitty meowed, letting her pass him then bounding out in front of her again. There was no line at the elevator—there usually wasn’t in this neighborhood. Tillie called it, they stepped in, and she said, “Parade grounds.” She took a deep breath. Mr. Kitty knew she was nervous about being called crazy again, so he rubbed his head on her ankles and purred. She smiled down on him as the doors slid open. She forced her way through the crowd which was trying to push their way onto the elevator before Tillie and Mr. Kitty could get off. Mr. Kitty slipped through the wake she made, out into a big, open, grassy circle that was lined all around with oak trees. There was a tall flagpole in the center of the field, surrounded by short walls with writing on them, and scattered around that were groups of humans playing frisbee, dogs running free without leashes, and other groups of people running around with brooms between their knees, throwing balls at each other. Tillie was right, Mr. Kitty did love this place. Why had he never been here with her before? 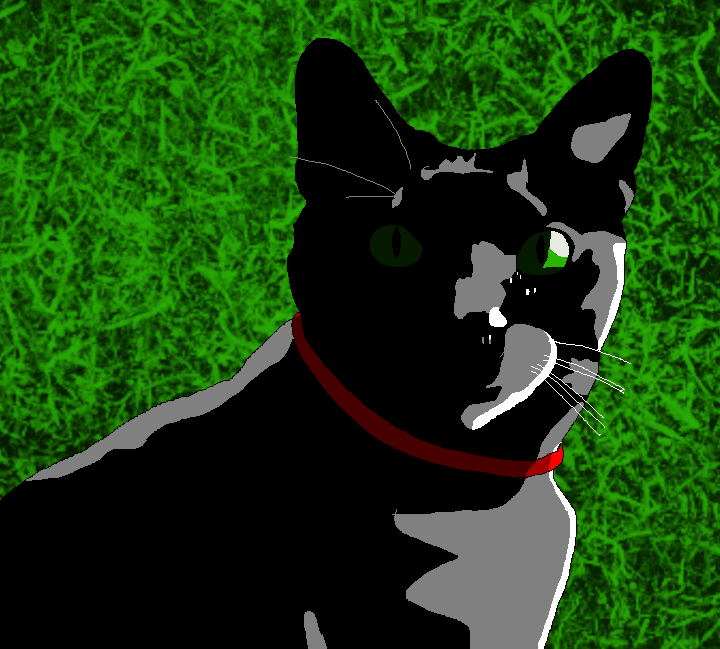 Mr. Kitty tore his attention away from all the new and interesting things to follow Tillie between gravel covered buildings and oak trees, past two big hills, down through a shady cypress swamp, to a patch of three-story buildings in the shade of a tall, ugly cement building. Tillie went up to the door of one of the shorter buildings and scanned a keycard. The door unlocked, and they went up a flight of stairs into a small apartment with three doors and a kitchen. Tillie tossed her backpack on the floor in front of the TV and walked around the kitchen with a sigh, checking the fridge and cupboards while Mr. Kitty crept around the place, sniffing everything and rubbing his scent on whatever called for it—most every surface. “Ugh. There’s nothing to eat!” she said. Mr. Kitty jumped up onto the counter to rub his face on the sink and smell all the corners of the kitchen when the door opened and a human came in to throw her bag on the couch. “You hear that, Mr. Kitty?” Tillie said, patting him a few more times and kissing him on the head. “No counter.” She put him on the floor, and he went over to jump on the coffee table and lick his coat clean, paying special attention to the spot she had kissed. “You have to be here?” Tillie raised an eyebrow. They both sat on the couch. The human reached out and pet Mr. Kitty. He let her go ahead for a few pats then jumped onto Tillie’s lap. “Yeah. It’s tough dealing with managers,” the human said. “No offense,” she added hastily. “What are you talking about?” It felt like Tillie was about to jump out from underneath Mr. Kitty. He prepared himself to leap off in case she did. “What did you argue with your dad about?” her roommate asked. “And that’s true, Emma,” Tillie said, looking her roommate in the eyes and nodding. “I know, Tillie,” Emma said. “Your gift is about the humans on the assembly lines?” Tillie looked confused. “I saw a picture on his computer,” Tillie said. “I knew they weren’t robots.” She shook her head, looking away from Emma for a moment. Mr. Kitty purred and rubbed his head on her hands. Emma looked away now. Mr. Kitty climbed over to her lap and rubbed his face on her arm. “So how could he not figure out if I did, right?” Tillie said. Emma still didn’t answer. She didn’t look at Tillie. She just pet Mr. Kitty’s head while he purred. “You can trust me,” Tillie said, zipping her lips and crossing her heart. “And that’s how I ended up meeting with that woman,” Tillie said, shaking her head. “And that’s how I knew what you would tell me,” Emma said. “Look, I can’t stand this blaring noise anymore. Let’s go for a walk. Your cat might enjoy it, anyway.” She pet Mr. Kitty who had all but fallen asleep in her lap. He yawned and stretched his paws out in front of him. “Yeah. I—uh—Sure,” Tillie said. “Let’s go.” She stood up, and Mr. Kitty jumped onto the coffee table to stretch some more. Emma stood and said, “One second.” then went back to her room and came out wearing a big hooded sweatshirt. “Alright. Let’s go,” she said, and they went downstairs and out of the dorm. Emma was right, too. Mr. Kitty did need a walk. He was too cooped up in their small dorm room. He ran through the grass, ate a few leaves of it in the falling sun, and almost lost Tillie and Emma in his excitement. He smelled another tree and clawed it a few times before running to catch up with them. “You can do it,” Emma said. She looked around to see if anyone was watching. “You don’t even have to do anything. Just come with me. Look.” She pulled a pouch out of her sweater pocket and handed a little disc to Tillie. “What is this?” Tillie asked, turning it over in her hands. “A bomb,” Emma whispered to her. Tillie stopped in her tracks. Mr. Kitty saw a bug and jumped on it. How would Tillie respond to this? She had finally found someone who believes her, but it had to be someone who might be a little crazy herself. He let the bug fly away and caught up with them again. Emma had scooted Tillie along so she didn’t make a scene. “Of course I wouldn’t have done it if it was dangerous,” Emma said. “Well, needlessly dangerous.” She winked. “Look,” Emma said, cutting her off. “Come here.” She dragged Tillie by the arm to sit down on the concrete steps under the flagpole. They had walked all the way out to the center of the parade grounds, far enough away from everyone so that no one could hear their talking. The field was clearing out the darker it got, anyway, and the sun was all but gone. “Have you taken any science classes in college yet?” Emma asked. Mr. Kitty didn’t care to hear the explanation. He didn’t care how things worked. He only wanted to know what they did and how that would affect him. And since he already knew the gist of what Emma was going to say, he had no reason to sit there and listen to the lecture. He knew it would be a long one, too, explaining how to bend space. Humans never could just walk to get from here to there. No, that was just too much work. But bending space so here is there, now that was less effort. Right? Mr. Kitty would never understand. He went off to chew the grass and sharpen his claws on a tree, then chase some squirrels—who were so much harder to catch than those pigeons. He climbed up a tree after one, to show it that he could, and licked himself on a branch while the squirrel cowered at the top of the tree. He climbed back down, and Tillie and Emma were standing from their lesson, intent on doing something. “Come on, Mr. Kitty,” Tillie called, motioning with her hand as they walked toward the elevator. Mr. Kitty sprinted to catch up with them, dodging through the legs of passing students. The door to the elevator slid shut behind him, almost clamping on his tail. He licked it and sat down. “The Scientist takes us,” Emma said. The elevator fell into motion, and almost as soon as it did, the doors opened. There was nothing to see but a cement wall, but Mr. Kitty recognized the stale oil smell. Tillie and Emma’s feet clanged on the metal floor as they stepped out of the elevator. “I hate this place,” Mr. Kitty meowed, looking at the wall where the door they had just come from used to be. She jogged down the tunnel with her footsteps echoing back behind her. Tillie took off after her. Mr. Kitty rubbed his face on the wall where the door was, giving it one last smell, then tore apart his claws trying to catch up with them. They went through the curving tunnel, down a few flights of stairs, then through another long tunnel to a big metal door that was painted with yellow and black stripes. They stopped to catch their breath, and Mr. Kitty licked his paws to rid them of the pain from running on the metal grating. “Not for her, Tillie,” Emma said, shaking her head. “For us. For the assembly line workers. For the betterment of humanity. This is bigger than the Scientist. She only helps. We do the real work to tear down the system.” She pressed a few buttons on the keypad next to the door, and the doors slid open with a hiss. Mr. Kitty jumped back and puffed up his tail at the sound of it. “How’d you do that?” Tillie asked. Inside was a squat room with lights and buttons flashing all over the ceiling. The ground was smooth and hard. It beat the metal grating but was worse than vinyl in Mr. Kitty’s opinion. Tillie and Emma had to duck to walk around. Emma watched Tillie marvel at the size of the place and the flashing lights. “What is this?” Tillie asked, still walking in circles and staring up at the flashing ceiling which almost seemed to go on forever. “All of it in one room?” Tillie scoffed. Tillie looked around at everything one more time. Mr. Kitty rubbed his face on her ankles. “So you’re really going to do something to stop them,” she said. Tillie scooped him up. “It sounds like Mr. Kitty agrees,” she said. “Do you agree?” Emma asked. Their laughs echoed through the squat room. Emma smiled wide. “Good,” she said. “Great. Take some of these.” She got a handful of discs out of the pouch and handed half to Tillie. “Start here with the red light. See it?” She pointed one out and waited for a response. “Yeah. Right,” Tillie said, nodding. They sprinted into action. Mr. Kitty rolled on his back and kicked at the air, then chased them around as they did their rip, stick, pressing. Emma finished a few discs before Tillie, even though she went further into the room and placed more of them, and when they were both done, they sprinted out of the tunnel, up the stairs, and to the elevator with Mr. Kitty close behind them. They all three collapsed laughing, coughing, and breathing heavily onto the floor of the elevator. “I can’t believe we just did that,” Tillie said. “I can’t believe I finally got to,” Emma said. “What do we do next?” Tillie asked. “I can get those pictures while we wait,” Tillie said. “Does that mean you want to join us?” Emma asked with a smile. The elevator fell into motion, and the doors opened onto the big empty field. Tillie and Emma left, and they didn’t notice when Mr. Kitty didn’t follow them. Tillie didn’t need him anymore, they had each other. The doors closed, and he let the elevator take him to wherever it would. That’s it for Mr. Kitty’s POV chapters. If you’d like to support the real life Mr. Kitty, who just walked across my desk while I was in the middle of typing, then think about purchasing a copy of the full novel here. Thanks again for reading. And we’ll be back next Saturday.